This is a huge paperback novel at a hair under 750 pages, all in smaller than average printing type. The cover describes it as ‘an epic novel of China,’ and that tagline fits this book perfectly. Off and on, I’d been reading this novel for at least 8 months. Modern writing instructors have the saying ‘show don’t tell’ when it comes to writing, inferring that all writing must conform to this biased standard to be considered good. I don’t agree entirely with this concept, just like I don’t agree that all heroic / epic writing has to fit Joseph Campbell’s Hero Journey outline. Author Bosse doesn’t accord with the idea either, as his perspective is more like ‘tell don’t show,’ to an extreme. You’ll see two or three pages of dialogue, followed by six to ten pages of physical descriptions, social customs, historical references, religious / mythological conjecture, and pretty much all under the sun including the price of goods in Shanghai. Think of a good spy thriller, where the protagonist takes a couple of pages to think things through before he finally acts. Double that time of deep, philosophical pondering, and double it again, and you’ll have an idea of what Bosse has done in this long, long, very long story. This is not to say that the story is bad or badly written. There are engrossing and revealing parts throughout this novel; the problem is it takes forever to get to them. We are presented with five main characters that we will grow to love, or hate, as the novel progresses. They are Embry, the Christian missionary who becomes a worthy soldier in a Chinese army, Tang, a general who wants to kick out the Japanese and return China to traditional values, Vera, a Russian prostitute trying to find happiness, Luckner, a German arms dealer who keeps Vera as his mistress, and finally, Kovalik, a Russian exile who promotes communism in China, despite that the communist ideal has already failed in his home country. Don’t get too caught up with any of them, because you’ll read about one or two for thirty pages, and then Bosse will move over to somebody else for the next thirty pages. Every one of these characters has intricate stories to tell and actions to go through during their time in the spotlight. This results in a tremendous amount of detail to keep track of, and that is one of the reasons why it took me so long to read this book. I had to read it in spurts, because I was working on my own writing projects and had to keep track of my stuff first. 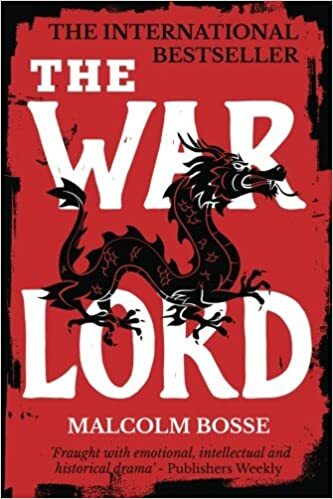 Speaking as a writer, there is an overwhelming amount of information presented / condensed into The War Lord. Bosse can drop one line into his story that will stick into my head, such as his wisdom regarding Chinese culture, philosophy or how religion and / or Westerners are viewed. (Everybody that is not Chinese is considered a Westerner.) Stuff like that will stay with me after I have finished a typical novel, and it will inspire me in my own writing. The drawback here is that Bosse will toss in these juicy morsels every four or five pages. There are too many to keep track of! A sentence Bosse writes might influence me into writing a couple of paragraphs, for example, or a couple of his paragraphs might become a couple of pages for me. There is too much intricacy and detail in this novel, more than the average reader will be able to handle, and so much even a lifelong reader like me gets overwhelmed, and even overburdened, by all that this story presents. In fact, I want to reread this novel, one page at a time, as a writing exercise where I can squeeze all the juicy parts out and modify them into my stories. Is this a great book to read? No, I can’t say that it is. It takes too long to get to the action and dialogue. Think of it more like a fine painting, where only a few can stand before it, for hours and hours, and discover its many angles and intricacies. Is it a very good book? Yes, I will put it into that bracket. You’ll have to learn to like all of its characters, even the selfish arms dealer and the drug-addicted communist, because if you don’t, you’ll have to wait 30 pages until the characters you do like come back into the picture. There are no true villains in this novel, as even supporting characters, such as the enemies of General Tang, have their motivations and ambitions explained. You’ll meet lesser characters such as poor rickshaw drivers, a young daughter from a family of Chinese nobles, the head bandit who kidnaps Embry, Tang’s military subordinates, etc., and they all add their little flavors to the overall broth. This novel is more about cultural, historical immersion, and the people caught up in that immersion, than about anything else. If you like profound historical novels, and you have the patience to get through the colorful yet lengthy verbosity, this might be your ticket to early 20th century Chinese escapism. You have to really be a detached outsider, an observer, to fully appreciate what Bosse has created here. One last word of warning; this novel contains many detailed instances of gore, violence and gruesome descriptions of death.